The safety of industrial robots has always been a major concern as they can build up large amounts of static and dynamic energy. Catastrophic consequences can arise in the event of a collision with humans. 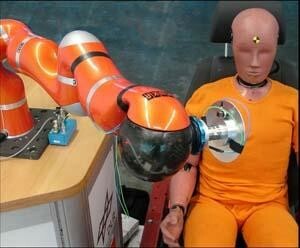 Traditionally industrial robots have been segregated from humans by placing them in an enclosure. However, if the robot carries out collaborative tasks with humans, this is obviously not a solution. Consequently, recent research in robot safety has been directed towards making robots safe to use in the vicinity of humans. This WP makes the human the central entity of the evaluation of safety in robotics. We argue that if human biomechanics are not taken into consideration, a realistic prediction of injuries resulting from a collision or the benefits of a particular countermeasure are not possible.